The Midori Brass series is a stationery line made of solid brass. This series proudly carries the "ages well"-signature; the longer you use it, the better it becomes. Over time, the copper within the brass alloy oxidizes and your brass item might develop some verdigris (i.e. rust). You could polish your brass item with some metal polish, but we suggest you just leave it, the more scratches, moisty fingerprints and verdigris, the better! Stylish pen holder for on your Traveler's notebook from the Japanese company Midori. 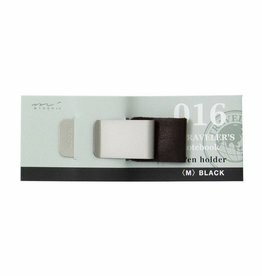 This lovely strong clip pen holder holds the body of the pen and is available in black and brown. Stylish pen holder for on your Traveler's notebook from the Japanese company Midori. This lovely strong pen holder holds the clip of the pen and is available in black and brown. Whatever you will write, you will write it down in style with this lovely brass pencil from Midori. This solid item consists of 2 parts and looks like a bullet sleeve when closed, a real delicate pencil! Whatever you will write, you will write it down in style with this lovely brass pen from Midori. This solid item consists of 2 parts and looks like a bullet sleeve when closed, a real delicate pen! Beautiful pencase from Midori designed in Japan. Made of solid brass this pencase will brighten up your desk and will safeguard all your writing tools! Whatever you will write, you will write it down in style with this lovely brass pencil from Midori. 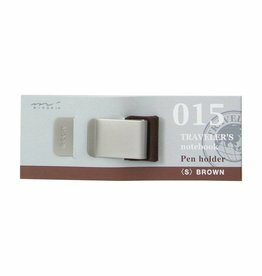 This solid item consists of 2 parts and is covered with a brown paint, a real delicate pencil! Whatever you will write, you will write it down in style with this lovely brass pen from Midori. 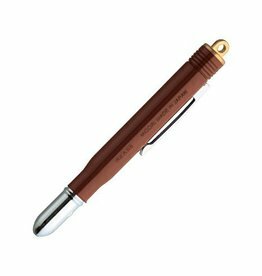 This solid item consists of 2 parts, covered with brown paint and looks like a bullet sleeve when closed, a real delicate pen! Wonderful classy black leather notebook from Midori for writing down everything you want. With all the different Midori refills very easy to make this a personal notebook with your desired filling!